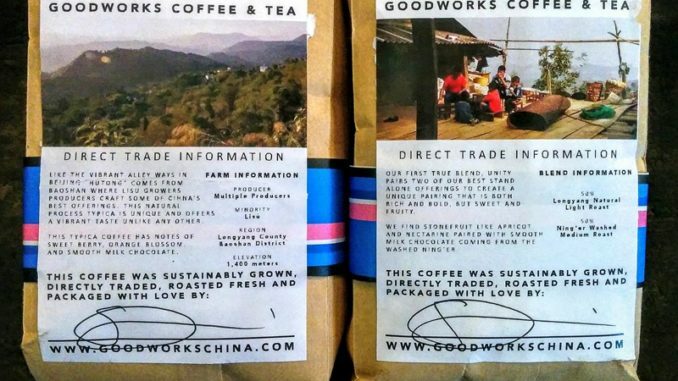 By Jim Boyce | GoodWorks, a visionary mission to sell coffee and tea from small-scale farmers in Yunnan and fund the training of aged-out orphans for jobs in cafes, will cease operations at the end of February. The project was led by Sam Cornthwaite, who died suddenly of acute pancreatitis in Beijing in September 2016. Several people then stepped up to run GoodWorks and keep the mission alive. Thomas Crow and Dan Crow first ran the project. When they left Beijing, Sue Zhou of Sue Zhou Does Food took over. Glenn Schuitman of Pop-Up Beijing was also heavily involved and had planned, with Zhou, to open a supporting cafe. But due to issues beyond their control, and a changing market, the GoodWorks project proved unfeasible. “There is no denying that, in many ways, Sam WAS GoodWorks, and we all agree that perpetuating his vision… is no longer viable,” stated a letter that was sent to GoodWorks clients two weeks ago and included comments by Zhou, Schuitman and the Cornthwaite family. In the letter, the Cornthwaite family thanked Thomas Crow, Dan Thurston Crow and Sue Zhou for their efforts to keep GoodWorks going. GoodWorks is slated to finish operations on February 28. Note: I help organize the annual campaign Maovember and GoodWorks was a 2016 partner. The donations unused by GoodWorks are being transferred to fellow 2016 partner The Library Project. We are asking Library Project to spend it on reading rooms in needy schools in Yunnan, the source of GoodWorks’ coffee and tea. Photos, details and receipts will be posted on the Maovember site here as those projects are completed.